It's been an another exciting week for Ghostbusters action figure collectors, and in particular, fans of the character Egon Spengler, with a new 6 inch Mattel figure closely resembling actor (and co-writer of the original movie) Harold Ramis hitting the company's online store and selling like the proverbial hot cakes. 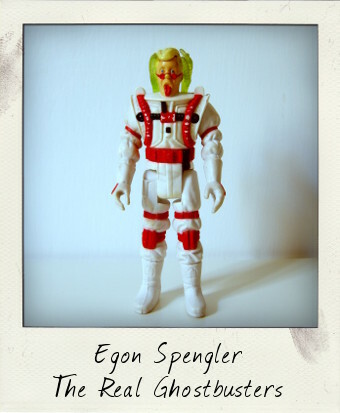 I thought it might be fun, therefore, to take a look back at a vintage Egon Spengler from Kenner's phenomenally popular line of spin-off action figures from the cartoon TV series The Real Ghostbusters. At 5 inches tall and with only 5 points of articulation, The Real Ghostbusters action figures saw Kenner at the top of their game with line after line of clever, interactive toys produced between 1986 to 1991. The Super Fright Features from 1989 continued that tradition with our heroes wearing bizarre space suits and terrified expressions. Our Egon Spengler here – voiced by Maurice LaMarche in the cartoon - has seen some heavy play-wear and there is some loss of paint to his suit, but the all important Ghostbusters logo transfer is in perfect condition. 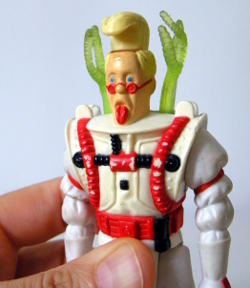 The original Egon package came with a weapon and the Slimy Spider Ghost and he was also wearing a detachable helmet, all three of which are now sadly lost to this figure. Curiously, his permanent expression is already one of terror, with his tongue extended - the other characters look normal by comparison - until one actually operates the fright feature. His Super Fright Feature is still working fine – if you slide a lever on the back of the figure the green tentacles and his quiff will rise up. A hair raising vintage action figure find!